Are you thinking the same thing as me and experiencing a scene of déjà vu? You have seen those shells a few posts ago and you might be thinking “encore!” (again!) but wait. Instead of a dark sweet filling, I am giving you a savoury one. For the other crowd. After all, there are people that just do not want anything to do with sweets. I mentioned this already, but my dad is one of those. He would exchange any dessert against a steak-frites-salade (steak/French fries/green salad). I am one of those people like Molly who will always have eggs in my fridge! Never short of them, or if I am , it is a major issue! 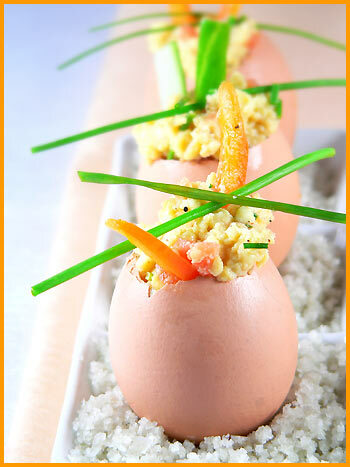 Eggs are so central to so many things I cook, whether it is sweet or savoury food. I might have been a bit of a Brit in a previous life since I love to eat eggs in the morning, hence my love for English breakfasts, when they are old school. Whether they are in an omelet, poached, scrambled, soft boiled or hard boiled, I can eat them at any time. In France, an old tradition was to be able to find hard boiled eggs on counters in cafés or at bistrots and troquets. When I am hungry and need a snack, hard boiled eggs are the way to go. And so, since the Weekend Cookbook Challenge is all about Easter Brunch and today is Easter, I had prepared a recipe from my Eggs book, Essentials Egg by Jane Donovan. I just added the presentation twist as I thought it would look much cuter to serve the eggs like this. Start by removing the top of your eggs using an egg topper if you have one. Empty the inside of the eggs in a bowl. Chop the salmon slices in small pieces. Beat the eggs, and add salt and pepper. Pour the eggs beaten in the saucepan and cook for a few minutes, while stirring constantly. Remove when you reached the texture you like and add the crème fraîche, mixing well. Add the salmon and chives and mix. 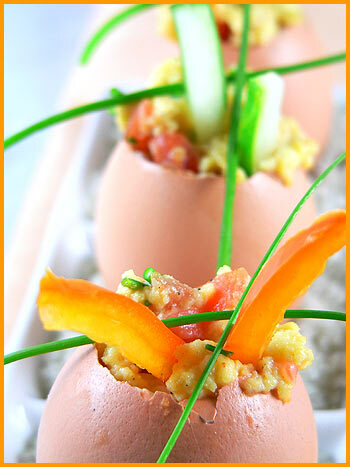 Take a small spoon and carefully place the egg preparation in the shells. Serve with decorating cucumber sticks and pieces of toast. 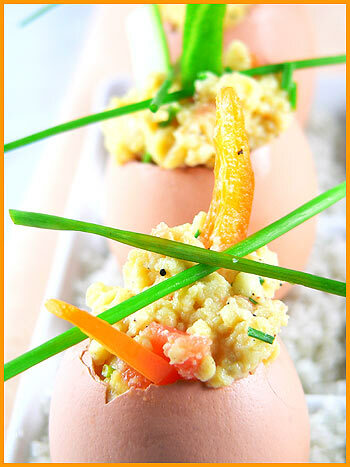 A twist in your typical scrambled eggs! Happy Easter everyone! Enjoy your Easter brunch! I know that your guests certainly will especially with such a lovely dish. This is a great entry for WCC. And the presentation is so beautiful. I agree about the eggs. They’re always in the refrigerator or else … we must run out to the store to stock up immediately. Happy Easter too, and your recipe is gorgeous, like always … Et quel brunch de Pâques ? Happy Easter, Bea! What a beautiful and fun idea! I hope you have a lovely brunch, and enjoy the beauty of all things new! Superbe, c’est sûr que ça change des oeufs en chocolat, et ça me donne faim tellement c’est beau! Beautiful la photo et la présentation ! (pas ok avec les normes HACCP, mais on les oublie celles-là et on se régale ! Très jolie présentation ! Bravo ! Ca donne envie de tester ! Happy easter Bea! If i have to choose.. i will..-3 per person.. he he.. je suis très gourmande! THey look fabulous Bea. Happy Easter. That looks so beautiful and delicious! Happy Easter! Wahou, those scrambled eggs looked awesome. Your photo almost makes me wanna eat some. j’aurai du venir plutôt pour profiter d’un brunch plus coloré par ta recette. Being a brit I love eggs especially scrambled ones. I have a great recipe for scrambled eggs which entails cooking them in a bain mairie over a medium heat, it is from Michel Roux’s excellent cookbook – Eggs which I highly recommend. Once again, absolutely stunning! What a great idea. The presentation is beautiful and I’m sure it tasted delicious! The day went by so quickly and it was so much fun! imachanelle, thanks. It was beautiful and I hope your day was good too. L, hope your day was good too for this birthday celebration! Barbara, Happy Easter to you too! Anne, mais oui, c’est pas loin! A la nage!! Gastrochick, yes I also sometimes do them this way and love them, even with tomatoes. Great idea! Ce n’était pas aussi beau que sur tes photos mais c’était tout aussi bon !! Merci. Beautiful presentation! Do you clean the egg shells out somehow not to cause contamination before refilling?